¶ 1 Leave a comment on paragraph 1 0 As the USPOD developed a philatelic relationship with collectors and citizens, the federal government established a postal museum and national collections that encouraged philately and spawned interest in postal matters. In 1894, the USPOD opened a small museum in Washington, DC that highlighted the accomplishments of the US postal service. Major museums were opening in American cities by the 1890s, and in Washington the Smithsonian Institution operated the National Museum on the National Mall. The Smithsonian had already established a philatelic collection in 1886, but the Institution did not hold a large postal-related collection until the Department officially transferred all of its holdings to the Institution in 1913.1 Through collecting and exhibiting stamps, stamped matter, and other postal-related articles, the federal government demonstrated to its citizens that these objects possessed national significance. ¶ 2 Leave a comment on paragraph 2 0 Once again John Wanamaker played a leading role in heightening the profile of the postal service to the citizens it served. Wanamaker was not the first postmaster general to suggest a museum, but he took the idea and provided the means and support for creating one. Philatelists noticed that he suggested establishing a museum in the Department’s annual report from 1890 and overwhelmingly supported the idea. One philatelic journalist wrote that other stamp-producing nations had opened museums and hoped “that our own country may soon take a leading place among them.” Not asking philatelists for assistance, Wanamaker instead looked to local and international postal officials for their help in collecting articles that represented “the progress of our postal system from its inception” that would “illustrate the work of the United States postal service, as well as that of foreign countries.” Stamps would be among many other items on display, including postmarking instruments, mail bags, illustrations of post offices and postal transportation, and various objects from other postal services.2 Not only would this museum be a place of great interest for Americans, but for philatelists from around the world who might visit Washington, D.C.
¶ 3 Leave a comment on paragraph 3 0 At this time some philatelists prodded the Smithsonian to collect and display stamps in the National Museum alongside “Indian relics, curios,” coins, and other specimens. The National Philatelic Collection, as it would later be named, at this time was distinct from the USPOD’s collection and began modestly in 1886 with the donation of a few Confederate stamps. Organized with other Civil War-era artifacts, the stamps hardly stood out among the other objects displayed in the museum as philatelists desired. Spencer Baird, a former Smithsonian Secretary, willed his stamp collection to the institution in 1888, but it was not available for public viewing. Collector Frank Moore felt that philatelists and stamps were “completely left out in the cold by the respected managers of this great institution.” To rectify this hole, he suggested in 1893 that all collectors send “good stamps” to the museum to build up the national collection.3 Even with these donations, stamp presence at the Smithsonian remained small until the two national collections merged in 1913. ¶ 4 Leave a comment on paragraph 4 0 The Department moved forward with staging exhibitions in the new museum drawing on their experiences from the Centennial and Columbian Expositions and built upon saved display pieces from the Chicago exhibit. Staged in a renovated storage room in the main USPOD building in Washington, Postmaster General Bissell bragged at its opening that this formed a “credible nucleus around which a great national postal museum” would be formed for the “benefit and interest of this and future generations.” Not only meant for collectors, this museum highlighted developments in all aspects of postal history, including a catalog of all stamps printed in the United States (1847-1893). Philatelists noted that the Department had begun collecting stamps from other countries, causing Mekeel’s Weekly to comment that even “Uncle Sam cannot resist the pleasures of philately.”4 As one might imagine, some philatelists were not satisfied with the state of the USPOD’s stamp collection. They thought postal officials should have kept a complete set of U.S. stamps ever printed and wanted the USPOD to hire a philatelist to curate the collection. ¶ 6 Leave a comment on paragraph 6 0 Given the high visibility and robust visitation numbers in the 1910s, it is difficult to understand why Postmaster General Frank Hitchcock shut the USPOD’s museum and transferred its holdings to the Smithsonian. Crowding in the main post office building forced Hitchcock to evict the museum, since the USPOD needed the office space. Hitchcock wanted the objects to remain accessible to the public, but wanted visitors out of the main Department offices. 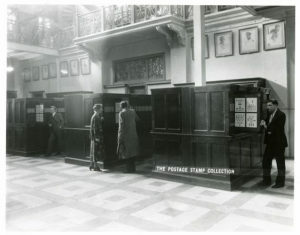 Recognizing that the Department was not equipped to properly care for its objects, including the large stamp collection, Hitchcock forfeited the collection in favor of an institution that could. After two years, the collections transferred to the Smithsonian.6 As non-collectors, postal officials did not quite understand the specific philatelic practices of caring for and displaying stamps. Hitchcock, like Wanamaker, believed that the government played a significant role in saving its philatelic and postal history even as it transferred the duties of preserving stamps as artifacts to the National Museum. A federal entity continued to collect stamps and postal-related objects under the auspices of the Smithsonian and not the USPOD—at least for the following two decades. ¶ 7 Leave a comment on paragraph 7 0 Club philatelists also believed that the government had a duty to recognize philatelic practices through proper care and exhibition of stamps. To the delight of the philatelic press, the Smithsonian hired Joseph Leavy in the first ever federal position of “Philatelist” to care for the newly transferred philatelic collections to the National Museum. Philatelic papers covered the news of Leavy’s hiring and praised him for his skills in mounting and organizing stamps in a “tabulated and orderly form.” For the first time, according to one philatelic writer, “we now have a stamp exhibit that may be considered a credit to us all.” Housed in mahogany cabinets and mounted under glass frames in the Arts and Industries building, Mekeel’s boasted that not even the British Museum had as “modern and up-to-date an abode” to house its philatelic collection. Even with this praise, members of the American Philatelic Society (APS) were extremely concerned, and a little confused, that the National Philatelic Collection might be abandoned and that the new Philatelist might be fired. In response to a frantic resolution passed by the APS at their 1916 annual meeting, the Assistant Secretary of the Smithsonian assured APS members that the philatelic collection was “as permanent as the life of the nation and has never been regarded in any other light.”7 In his statement, the physical permanence of that collection equated to the strength and permanence of the US, together with all objects held by in the History Division of the National Museum that, in theory, collectively illustrated the history of the US. ¶ 8 Leave a comment on paragraph 8 0 This transfer from the Department, or the producers of stamps, to the federal entity charged with preservation and diffusion of knowledge, signified a shift in how philatelists and citizens would view stamps once printed. Stamps were not merely physical representations of prepaid postage, but they also contained historical significance once printed, worth saving. Philatelists, of course, understood this from the earliest days of collecting. Even John Wanamaker saw value in establishing a public exhibition space for displaying stamps and postal-related objects in federal buildings as the Department had begun—after the Columbians—printing stamps that represented selected scenes from the American past. ¶ 10 Leave a comment on paragraph 10 0 The physical construction of stamp displays—whether at the Smithsonian or in other public exhibition spaces—encouraged viewing of stamps as individual snapshots of stories or scenes. Lacking contextual information about the subjects represented on stamps encouraged viewers to look at the stamps as products of their design—printing techniques, colors, grills, perforations—and not for the circumstances which produced those illustrated stories. This type of museum presentation was not uncommon in early twentieth century museums, where objects stood in cases lacking explanation. Curators working in the early twentieth century did not create thematic narratives that placed objects within a rich historical and cultural context. Rather, the object’s significance was understood to be inherent and obvious to observers, and often a short label identified only the title of an object.8 This type of display encouraged an uncritical assessment of the stories told on stamps and did not address the stories or images did not show. Hiring a philatelist, not just a curator trained in museum practice or in history, signified that the federal institution of national memory formally acknowledged that philately was a distinct and valued practice. ¶ 11 Leave a comment on paragraph 11 0 Maintaining a philatelist on staff to replace Mr. Leavy in 1921 was important for the Smithsonian when they announced the position upon his retirement. In addition to taking the Civil Service exam, the government required applicants to have a high school diploma and philatelic experience and “work as an amateur collector” would not be considered. The government formally drew distinctions among collectors, something that we know philatelists had done for years. Just as Leavy’s personal and professional life revolved around stamps, so would his successor’s. Catherine L. Manning earned the position and became known as “Uncle Sam’s First Lady of Philately.” She began collecting when she was a girl and then worked for stamp dealers, including the well-known stamp dealer, J.M. Bartels. Manning’s selection also highlighted that while most philatelic clubs banned female membership, many women still collected stamps. By the 1930s, the Philately section of the History Division became well established at the Smithsonian.9 As both the Smithsonian and the USPOD saw value in saving stamps as part of the national story in the 1910s and 1920s, the Department saw the popularity of collecting rise, and they recognized the need for a better way to handle requests from collectors.